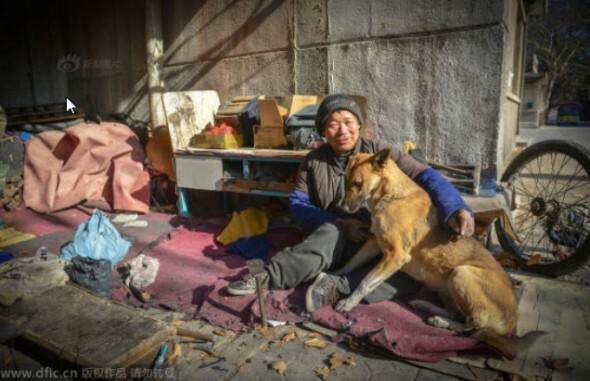 A humble handicapped man from China works as a shoe shiner, and every day he gets to work thanks to his untrained service dog, who pushes his wheelchair. Big Yellow, a mutt from China, has never received proper training as a service dog, but since he was born two years ago, he started helping his handicapped owner get to work each day. 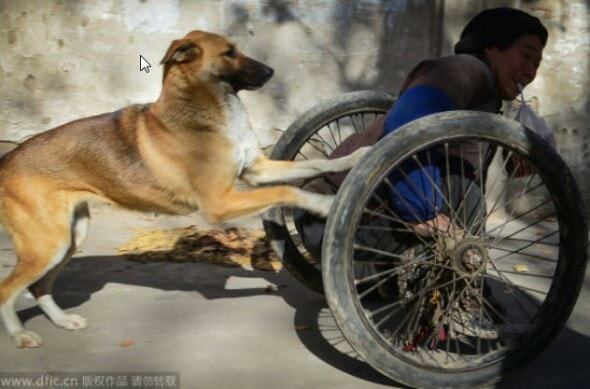 The dog’s owner is a humble man named Ma, who at the age of six battled polio and sadly was left unable to use his legs. All his life, he has had no money to afford a wheelchair and has never received government aid, but somehow he always managed to construct the makeshift wheelchairs he uses to get around. The man is a widower and never had children, and for over 40 years his only family has been dogs. Today he is a shoe shiner and with the help of Big Yellow, Ma travels little over half a mile every day to get to work. His loyal dog pushes him there. 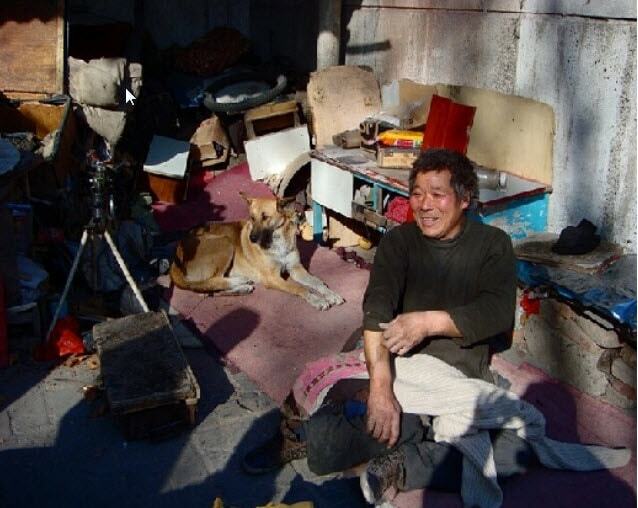 As a shoe shiner, Ma doesn’t make much money and many days he and his dog go hungry. For lunch, the shoe shiner eats pieces of bread, and kind neighbors (restaurant owners) bring scraps of meat to feed Big Yellow. The story of this humble man and his dog went viral and people criticized the government for never lending Ma a hand. Thanks to critics and public pressure, the government responded and provided Ma with three wheelchairs, a flat screen TV, a microwave, a washer machine and a portable electric stove. The government has also promised to give Ma a subsidized income, something he should have been receiving 20 years ago. It seems Ma and Big Yellow won’t be going hungry anymore. Please correct to “disabled” not “handicap”! I have a disability but I am not a handicap the term is not used any more. Sad story with some happy ending. It’s instinctive to be helpful. My cat’s always helping me. Dogs are way awesome and intutive…..love the loyality…. And to think that big yellow was probably rescued (although the story does not say) from the meat market in China … And look… He is now helping someone. Dogs are amazing animals! Sad story with a great ending. and yet a lot of people in China are still cruel to dogs, and eat them. ugh. They should all see the great story of these two! I would love to see a follow up story of Ma and Big Yellow. Both deserve a better life. You hear about people miss treating dogs but look how loyal and sweet they really are ! They should be loved not misstreated. God bless both of them. Family is family doesn’t matter of they have 2 or 4 legs. This dog deserve better. It can’t be pushing a wheelchair. Dog can get hurt and needs medical attn. His leg looks swollen. The man needs to live off the street and his dog as well. The more I know humans the more I love my dog. I seen the words that he’s getting a wheel chair , t.v. etc. , but do not see the change , I feel bad for both of them , and i agree with the comment that dog should not have to push that man everyday ,Lets see the change !!!!!!!!!!!!!!!!!!!!!!!!!!!!!!!!!!!!!!!!!!!!!!!!!!!!!!!!!!!!!!!!!!!!!!!!!!!!!!!!!!!!!!!!!!!!!!!!!!!!!!!! !